It is only about 18 months since manufacturers started putting Freeview tuners and HDMI outputs into digital recorders, but already it's almost routine. Pioneer's machines have usually been versatile, but they only had that magic combination from late 2006. This luxury next-generation model pushes its specifications one step further by scaling up to 1,080 lines in progressive scan. It also improves its multimedia Jukebox feature for keeping photos and music on the hard disk along with TV recordings or camcorder footage. The recorder is styled in glossy black to match most modern flatscreens. A folding flap reveals numerous front inputs, including DV-in for digital camcorders and USB for PCs (with Windows Media 10), digital cameras or plug-in memory gadgets, from which you can play or copy MP3 and WMA music or JPEG photos. There's also a slot for a Top Up TV or Setanta Sports subscription card module. The back includes the expected HDMI port and two Scarts (both RGB or S-video capable, in and out) plus component video for up to 576p output. HDMI is the one to use, of course, as this promises DVD and TV pictures upscaled to near-HD quality in 720p, 1080i or 1080p. As well as built-in Freeview, this powerful recorder can control external satellite and cable TV boxes using its GuidePlus timer menu. There's a built-in Freeview-specific EPG, too, but we'll say more about that later. The machine plays and records to all standard DVD formats and plays DiVX video from discs. The ample 250GB hard drive holds up to 711hr of video in the lowest quality mode or 36hr in the best quality, which is the spectacular 15Mbps XP+ setting. There are various preset recording modes and a manual option to tailor the quality or running time more specifically. If you only want to record TV from Freeview, it is better, in case of schedule slips, to use the digital EPG, because start and finish times can be tied automatically to the actual broadcast. The guide also includes the series recording feature to set the next episode for you or help find repeats if timer settings overlap. As a single Freeview tuner recorder, this is essential if you record lots of programmes. A drawback of the digital EPG is that you cannot refer to it while recording, whereas the alternative GuidePlus will appear on command at any time. You can switch between EPGs, but it's inconvenient and you lose any timer settings you've already made. The remote control is rather plasticky, but its layout has been slightly improved from recent Pioneer recorders. The DVR-LX60D continues the brand's tradition of enabling you to use almost any other feature while recording onto the hard disk - whereas most digital machines are virtually locked up when recording. For example, you can reformat DVD-RWs, refine existing recordings using the copious editing features and make high-speed DVD copies without interrupting any ongoing HDD recording. Once you're used to this, you'll realise what a time-saver it is. A disc back-up facility is also on hand for duplicating home-made DVDs in case the original material has gone from the hard drive. Naturally, you can do basic HDD/combi functions such as playing from disc or hard drive while recording on HDD. A great new addition is automatic chapter creation, which puts markers at major scene changes and helps to skip or chop ads. It doesn't work as intelligently as Sony's now defunct equivalent introduced in 2005, but it's welcome to see another try. 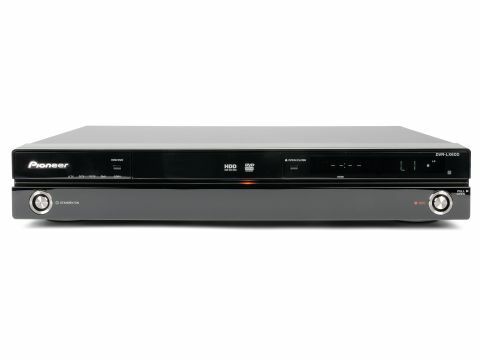 If your Freeview reception is not up to scratch, the DVR-LX60D provides a decent calibre analogue tuner. Overall, the digital reception and recording quality are excellent, as long as the original broadcasts are acceptable. The upscaling visible via an HDMI connection improves quality slightly, though this is more effective for DVD playback. The top two preset recording modes, XP and SP, capture impressive levels of detail. The manual settings access a wider range of modes, including the hard-drive-only XP+, ideal for digital camcorder footage. Quality levels remain excellent down to the manual 16 setting (2hr 50min on a single layer DVD) and very good down to the manual 12 position (3hr 30min on a single disc). With the LP preset (4hr on DVD), there is a noticeable loss of sharpness. Rapid motion becomes blocky and edges look rough, but both this and the EP (6hr) modes are acceptable for vivid looking programmes such as cartoons. The SLP, SEP and lower manual modes can squeeze a massive amount of extra hours onto the hard drive and DVD, but at the expense of watchable pictures. Commercial DVD playback is as full of contrast and naturalistic colour as the Freeview performance. It's highly detailed and remains solid even when upscaled to the higher resolutions. Fast scenes, such as those in Hot Fuzz, pose no major problems and, as a player, it also handles subtle hues reasonably well, such as those in Danny Boyle's Sunshine. This machine is a fine audio player too, for CD vocals and instrumentals and movie surround sound, such as Apocalypto's vibrant DTS track. Its MP3 and WMA support is also well above average, while the Jukebox storage features and fast CD ripping (in full LPCM quality) mean you can play or keep a lot of audio with this one device. Music files copied from PC or home-made discs keep any track names that are attached to them. But you won't get album or track names when directly transferring from CD, because there's no network access to the database we've become used to finding in dedicated HDD jukebox-type products. Pioneer has built on its track record of well-specced digital recorders with this smart product that does just about everything you could want without compromising on performance. It's not the cheapest combi, but it's among the best.